Are you looking for a career that is in high demand and that pays well? If so, you should consider becoming a dental hygienist. A dental hygienist is a licensed dental professional who focusses on the prevention and treatment of oral diseases. Their primary job is to assess a patient’s oral health using dental x-rays and other assessment information, remove soft and hard deposits from teeth, provide adjunctive treatment based on their oral health state, and educate them about preventative measures available that can contribute to prolonging the health of their teeth and gums. In the state of Ohio, a dental hygienist works under the direct or general supervision of a dentist in dental practices. Their uniform consists of scrubs, tennis shoes, safety glasses, a surgical face mask, and medical gloves. What Are Some of the Advantages of Becoming a Dental Hygienist? There are several advantages of becoming a dental hygienist, which includes a flexible schedule, making a median pay of $30 per hour, and having an industry growth rate which indicates that by 2026 there will be over 40,000 new positions waiting to be filled. 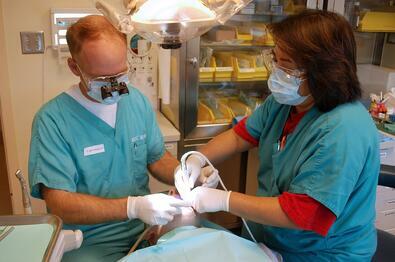 What Degree Does a Dental Hygienist Need? At the minimum, a dental hygienist must have an Associate of Applied Science in Dental Hygiene degree from an accredited program to be eligible for licensure in the state of Ohio. Where Can I Get the Training I Need to Enter This Profession? Located at Hocking College’s Perry Campus in New Lexington, OH, Hocking College’s new Dental Hygiene Program offers the required training in general education, biomedical sciences, dental sciences, and dental hygiene sciences. Students who successfully complete this program will be eligible to take their national and regional board exams, and their state law exams in order to become a registered dental hygienist. For more information on Hocking College’s Dental Hygiene Program, contact Program Manager Alaina Himes by email at himesa@hocking.edu or by phone at (740) 753-6460.